Below is a cut from the current issue of Inc. Magazine in which they interview leadership and business consultant Ken Blanchard. Below the interview, I posted a couple of questions for comment. Twenty-six years after publication of The One Minute Manager, Ken Blanchard has written The One Minute Entrepreneur. Blanchard, co-founder of an eponymous, 300-employee consulting firm in Escondido, California, spoke with editor Mike Hofman about leadership and fair pay. Your new book says that a leader's job is to make sure that the people in a company are taken care of. Does that mean that entrepreneurs who set strategy and demand results, no questions asked, are ineffective? If your employees are disengaged, and they don't take care of your customers, it doesn't matter how good your strategy is-your customers will still go somewhere else. There's so much competition today that no customer has to put up with abuse. As a leader, you absolutely must expend your energy engaging your frontline employees so that they will take care of customers, who will tell stories about how great your company is to other people, who will become new customers. It's interesting to me that the distribution of salaries at most companies gives top managers a huge premium for their supposedly great strategic thinking, while people who deal with customers and operations are paid much less on average. This is not to say that strategy isn't important. Leadership is about taking your organization somewhere. But the how is as important as the where. Do you practice what you preach at your own company? We take steps to ensure that pay is fair. We try to make sure that nobody earns more than 10 times the lowest-paid full-time employee. And we have something we call a gain-sharing program, which means that when we hit a profit target, everyone in the company gets a check for an equal amount. Let's say in a given year it's $2,000 per person. For the people who make $30,000 a year, an extra hit of $2,000 besides their annual raise—well, I think that's a powerful way to engage them. How do you handle questions of fairness and pay equity when the company isn't hitting its targets? What is legal, what is fair, and what will the effect of the decision be on my self-esteem? Layoffs would have been legal. I'm not sure they would have been fair. And I know they would have destroyed my self-esteem. So we decided instead to institute a hiring freeze and salary cuts across the board for six months. The cuts were higher for people who made more, and people who made below $50,000 a year were exempt. We felt that a salary cut at that level would have been too harsh. Everyone in my family who is on staff—five of us, including me—took a 25 percent salary cut. We also suspended matching 401(k) contributions for a year. And we told people that when we pulled out of the slump, we would take all 300 employees on a four-day, all-expenses-paid trip to Hawaii. The business did rally, eventually, and we made good on our promise in 2005. The trip cost us $625,000, and in my view it was worth every penny. Can you imagine a public company worried about its quarterly numbers investing that kind of money in its people? We wouldn't take our company public if our last breath depended on it, precisely because you can't do things for the long-term benefit of your people when you're public. The problem with American business today is that Walt Street demands short-term thinking, which means that businesspeople focus on results and forget about the important people part of their jobs. How should non-profits/churches "take care of their people"? Why or why shouldn't non-profits/churches reward and recharge their employees financially or with trips and retreats? 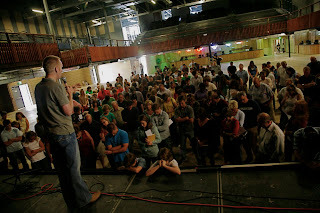 34 people that we know of stepped over the line of faith and walked into a relationship with Jesus yesterday. And they did that almost exclusively because someone invited them to come, prayed for them, and followed through to bring them to an introduction to Jesus. Thank you to LHC for being the kind of people who care about people and introducing them to the unconditional, uncompromised love of God. That is who we are, and so that is what we do. Tomorrow's my day off, and I'm really working on Sabbath as a spiritual discipline, so here's two posts in one. It's funny that it takes discipline to take time off. And that God commands it! FIRE ~ I just got home from an incredible opportunity with my son Joseph. A generous friend invited us to a dinner for Still Water Sports Camps. And the speaker was Mike Swider, Head Football Coach at Wheaton College. I wouldn't say he's "on fire". He is fire. He is a capital-L Leader. His message was so right on the money on so many fronts, but the fact that Joseph got to hear from someone so passionate about Christ, enthusiastic about life, and challenging was an even greater benefit. 1. People who are not Christ-followers. We are going to address some of the most prevalent challenges to the Christian faith. 2. People who are Christians. We're asking everyone who goes by the name of Christ to engage and invite someone you know this weekend who doesn't yet know how extravagantly God loves them. Pick them up, buy them some Starbucks, take them to lunch...do whatever works to introduce them to Christ. My message is entitled "Water" and will kindof wrap up the series Overflow that we've been in. I'm praying for 5 people right now that I know are coming who don't know Christ that have been invited. God is going to use our faithfulness to Him in a powerful way this weekend and beyond. Just a reminder: There is nothing more spiritually mature than pointing someone toward the love of God in Christ. Nothing. And we get to do that. Thank you in advance for being the kind of church that cares about people like you do. Also, be praying for our Women's Retreat "Destination Retreat". Over 170 women are gathering at Horseshoe Bend this weekend for an incredible time of rest, fun, food, and challenge. Teri Brown and her team have done an incredible job of preparing for God to move in a big way out there. And, now, Sabbath. Take care. 1. LOYALTY IS TIMELESS. Real, down in the trenches loyalty never goes out of style. I do think it's less prevalent in our culture than it was even a couple of generations ago. But, that fact makes the presence and practice of loyalty stand out all the more when we do see it. 2. LOYALTY BENEFITS THE ONE WHO GIVES IT. Every time someone gives loyalty to a friend, boss, coworker, church, pastor, or family member, they are better for it. 3. LOYALTY BENEFITS THE ONES WHO SEE IT. Loyalty strengthens community and deepens relationship resolve. 4. LOYALTY DEMANDS SACRIFICE. Loyalty always costs something. Disloyalty costs more. I just happened to stumble across this writing of Bobbie Houston's on this subject. Bobbie and her husband Brian lead Hillsong Church. Where have you seen loyalty lived out and benefit others or yourself? LHC Downtown Open House was HUGE! Over 230 people came to check out the Austin Music Hall, meet others who are going to be a part of LHC Downtown, pray, and dream big dreams. Thanks to all of you who chose to make last night a priority. I think we all got just a small but sweet taste of what God is doing and letting us be a part of. If you couldn't be there but want more information about LHC Downtown, email Chad Zunker, Downtown Campus Pastor. As we said last night, we'll open doors for worship in the fall, but the church starts NOW. So the Richard women are out of town. Gone on a girls' weekend with Julie's mom, her sisters and their daughters. Joseph and I are back home batching in the ATX. Driving to school and listening to a morning sports show, the guest is Reid Ryan, CEO of the Round Rock Express. They're the AAA affiliate of the Astros. When he says their home opener is Friday night, Joseph & I look at each other and we had our plan. I dropped him at school, came home and bought two tickets to sit on the outfield berm ($6 per!) to watch the game. It was an absolutely perfect night...Not a lot of cash and a lifetime of memories and male bonding. Joseph created a new verb, berming, to describe sitting on the berm watching baseball. I hate it when Julie's out of town. But Friday Night Berming definitely took the edge off missing her. Finding a time to meet with God 1-on-1? Investing yourself in growing your faith? Loving God by expressing worship to him? Laying out your sins in confession? Expressing gratitude and then requests? Devoting yourself to him each day? Also, don't forget this Sunday at 5pm we're hosting our first LHC Downtown Open House at the Austin Music Hall. It's going to be a great night of vision, excitement, community, prayer, and meeting new friends who are going to be sharing in this adventure. For more info, email Chad Zunker LHC Downtown Campus Pastor. If you don't know about LHC Downtown, check out this intro video. Since before Day One of LHC, we have always known our mission was not to be a big church, but to be a healthy one. Of course, because we are located in a metropolitan area of >1.3 million people, if we are healthy, we will grow in size. The # of people stepping into faith in Christ for the first time. The # of people getting baptized as a statement of faith. This last one is the one that I think is the stickiest to evaluate. How do you determine "spiritual development" when it is personal and universal, individual and communal, as well as mysterious and obvious? What criteria would you suggest in evaluating the spiritual development of a particular church? There's really no other way to describe the day. It started out with the pure fun of taking my 13-year-old daughter to school. Neither one of us is a big a.m. talker, but we really enjoy that time that's just us. And, every day that she still enjoys being with me and being family is a gift. Next, I found out that a good friend had passed away. Vanessa Whitwell was a key member of the staff at Fellowship Church and in the absolute prime of life. 34 years old, she had a headache come on last Thursday, slipped into a coma, and graduated to be with Christ last night. No one packed more God-honoring living into 34 years than she did, and I know she's with Christ face to face. But, I can't imagine her husband Andy and what he's experiencing right now. I also know she was such a rare gift she was to Ed & Lisa: a loyal friend. Vanessa did more to move the Kingdom of God forward than most people even consider doing. All of us who knew her, and those who knew her so much better than I did, were incredibly blessed by her life. THEN...I got to have lunch with the lead pastors of our church for our monthly roundtable. Just getting to work with these people and laugh, lead, serve, dream, and strategize with them is one of the greatest blessings and privileges I've ever had. It's such a unique mix of talents, passions, personalities, and backgrounds. But it works. Big time. THEN...I got to meet two of the finest young men I've ever been around. Jack and Joey are brothers who are raising money to buy instruments for the kids at the Pan de Vida women & children's shelter in Mexico. They came up with the idea to sell t-shirts to raise money, and they've already amassed $1200 for their troubles! They had to order a second printing of the t-shirts! What a privilege to visit with them and their CFO/Chauffeur (mom, Jennifer) and to affirm what God's doing through them and in them. So, the circumstances of this Monday were truly manic. But God was real and palpable in all of them. To him be the glory.